The GLOW plasma system is designed for high reliability and affordable pricing (under $6,000 dollars). It Operates at 100 kHz, —– no tuning is required! 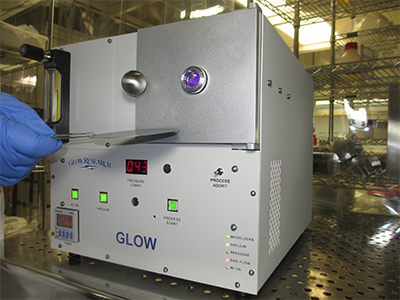 The GLOW is a desktop / bench top sized system suitable for lab, university or production applications. It can perform a host of surface treatment applications such as plasma cleaning, removing photoresist, prebond cleaning / conditioning, PDMS bonding and organic removal. Glow Research makes the entire system—so we are able to provide a very reliable plasma system and pass on our cost savings to you. The chamber is constructed of high grade aluminum, and is anodized for durability. There are two sample shelves—one for plasma processing, and the other RF powered shelf is for ion assisted or more aggressive processing. The chamber door has a dynamic hinge to prevent pinching of the O-ring and to increase vacuum integrity. The front 7-segment display will report the chamber pressure so that a process can be easily established. A reliable Pirani gauge is used in the pressure read back system. The GLOW plasma system is equipped with a 100 kHz, 50 Watt generator that requires no tuning. Standard features include an “abort” button that terminates the running process which turns off RF power, halts process gas flow, and resets the process timer. Safety interlocks prevent activation of the RF power and gas flow when the chamber door is open or if covers are removed. The GLOW has passed rigorous testing and is CE marked. Glow Research offers a pump for use with either a hydrocarbon vacuum pump or a pump with Fomblin type oil for use with oxygen gas. Dry Scroll pumps are also available. 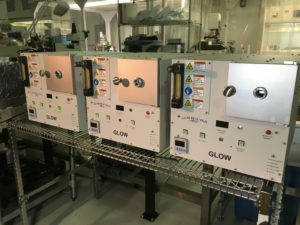 The Glow plasma system is easy to install—just plug in to a standard electrical outlet, connect the process gas, connect the vacuum pump and the system is ready to process. Glow Research plasma systems conform to all international electrical standards. We ship world-wide. The Glow plasma system operates at 50 Watts for Plenty of Power. There is no arcing or sparking. Download a brochure of our GLOW system.